With 560 stores in 19 countries, Carmen Steffens is today one of the most prestigious and admired brands in the footwear, clothing and accessories industry. The brand is preferred among celebrities like Madonna, Jennifer Lopez, Paris Hilton and Eva Longoria. In 1993, Mario Spaniol created Carmen Steffens, naming the brand after his mother. The company’s main goal was to mix Brazilian creativity with the main global trends. In just a very short time, the brand earned a name for itself, not only in the Brazilian market, but also internationally. Since the very start, Carmen Steffens has earned distinction with its products, which combine beauty, comfort, and exclusivity. The Carmen Steffens production infrastructure, which includes its own tannery, allows the brand to create exclusive, high quality products, resulting in 11 collections distributed per year. 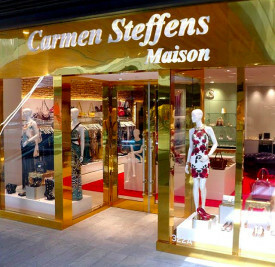 Carmen Steffens was born with the desire to design and manufacture exclusive, sensual, elegant and unique Brazilian fashion and offers these through a captivating retail experience to fashion-forward consumers who are style conscious, brand savvy and don't mind being noticed. The brand showcases its unique identity through products which incorporate international trends with Carmen Steffen's unique Brazilian style that seduces and wins customers loyalty worldwide. Carmen Steffens builds and maintains a loyal and ethical relationship with all employees and business partners; produces products through a combination of innovative design, efficient modern technologies and individual craftsmanship. The brand maintains the highest standards regarding both quality and comfort, all while exercising social responsibility and respecting the environment.